Last week I wrote about taking one thing at a time. I wrote about how important it is to slow down and breathe for a minute if you’re feeling overwhelmed. I also divulged about my minor (ha) mental breakdown over being too busy and stressed out this fall. Sometimes, I really think I should heed my own words instead of just writing and publishing them. At any rate, as if I didn’t have enough things going on in my life, I’ve decided to participate in National Novel Writing Month for the first time. For those of you who don’t know, NaNoWriMo is an event orchestrated every November by the Office of Letters and Light, a creative writing non-profit agency, that encourages writers to hammer out a novel (50,000 words to be exact) in a mere 30 days. If you do the math (which I rarely do, since I’m a writer) that’s writing a minimum of 1,667 words a day starting today and ending November 30th. No editing, no deleting, just writing. It actually works out quite nicely for me since my birthday is December 1st. This means that, if I finish this, I will give myself the first draft of an original novel on my 26th birthday. You’re welcome, future self! 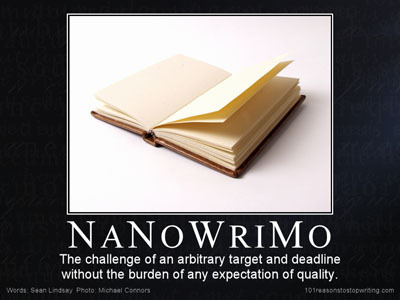 While I officially committed to participating in NaNoWriMo 2011 last week, I’ve actually been contemplating it since NaNoWriMo 2010. I didn’t participate last year because, well, I don’t write fiction. As a matter of fact, the last fiction I wrote was probably some dumb poem in college and I undoubtedly burned it before anyone else could find and read it. But, a handful of people have told me over the last year that I should write a book. So, I thought, why not? Apart from being so disgustingly busy and on the verge of burnout, you mean? Well, I don’t know, why not? Hey! No one asked you, inner monologue! Not tell anyone about my 50,000 word goal in hopes that if I failed at it I wouldn’t be embarrassed. Tell all my friends (and blog readers) and ask them (you) to hold me accountable and pray for me during this inevitably stressful month. Clearly, I’ve chosen the latter. But not intentionally, mind you. At first, I was going to go with option number 1. I didn’t want to tell anyone. Writing a novel in 30 days (ugh, typing it out makes me tremble with fear) is arguably the most terrifying and difficult thing I’ve ever attempted and, at this point in the game, failure seems pretty imminent. But, once I squeaked the news to my husband, he felt so proud of me (for what?! I haven’t done anything yet!) that he compulsively broadcasted the news to any and everyone he came across. What a guy, that husband. What. A. Guy. And so. I’ve told people. And I’m telling you. And I’m asking for support, love, and prayer throughout this process. (Oh, um, and I’m getting a pool going to see how many days into the challenge that I’ll publicly break down mid-composition in indecipherable sobs. What’s your bet? My money’s on November 15th — exactly half way to either success or failure. Come on, big money!) And in case you’re wondering, I will still be blogging throughout November. I can feel my eyes drying up and the carpal tunnel starting to set in already! Yay! TODAY’S SELF-LOVE TIP: BE HELD ACCOUNTABLE. If you think writing a novel in 30 days is a lofty goal, remember that making a commitment to change your mindset and love yourself is a pretty solid aspiration as well. As much as I’d love to say that I’ve made this transformation on my own, I can’t because I’d be lying through my teeth. I couldn’t have gotten to where I am today without being open and honest with my close friends and family about the things I struggle with and asking them to support me in recovery. Yes, accountability is scary. Oh lord, do I know it. It’s terrifying to be watched and guided. But it’s necessary for growth and change. Leaning on other people is not a sign of weakness. Rather, it’s a sign of maturity and acceptance that we weren’t created to be strong enough on our own. We were created to allow the strengths of our peers step in when our weaknesses reign supreme. And so, I challenge you to open up and ask to be held accountable. Ask someone you trust to call you out when you talk negatively about yourself or others. Ask someone to go jeans shopping with you and reinforce your mindset that the size number on the label doesn’t define your worth. When you let someone else carry a part of your burden, it becomes that much lighter. Also, I ask you to hold me accountable in November. I’ve set out to do something and darn it I want to do it. But I know I can’t do it alone. Be there for me, friends? thanks so much! come back and read more! i try to entertain, ha.